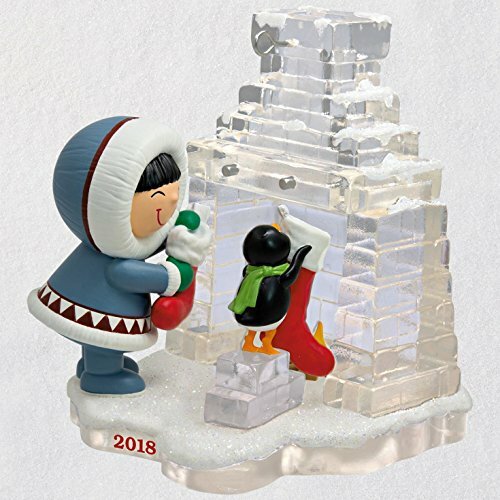 Celebrate a season of friendship as Frosty and his penguin pal hang stockings on their glittery, snow-covered fireplace made of ice. This fun Christmas tree ornament is 39th in our longest running series, Frosty Friends. Coordinating Frosty Friends book sold separately. Christmas tree ornament is 39th in the Frosty Friends collector's series. Artist crafted by Tom Best, this Christmas tree ornament comes pre-packaged in a box for easy gift giving, preservation and storage. Year dated 2018 on ornament.